We all like to think of ourselves as someone who works alone, a lone ranger. In fact, the term ‘lone ranger’ comes from a popular television series, based on a novel, in the 1950’s. Now, calling someone a lone ranger is synonymous with deeming them as someone who needs little or no help; someone who is completely self-sufficient. What people often forget is that the Lone Ranger needed the help of Tonto. I tell you this because it highlights the fact that everyone needs help; no one gets where they are without it. Before my ordeal, I was always reluctant to ask for help. I aspired to be a ‘lone ranger’. In fact, I have mentioned before that I initially began my training in the specialty of Emergency Medicine (EM). I then switched to Family Medicine after one year of EM training. I have many reasons for this switch, but one of the main reasons is that when I entered into Emergency Medicine, I was hoping to be in a specialty of medicine that required little assistance from others. After being in the ED I realized this wasn’t the case: actually most cases required the aid of others. This trait of mine became magnified immediately after my surgery, as I hated the idea of asking for help. Even asking my assigned nurse for medications for pain was difficult for me. After my discharge I continued to be reluctant to ask for help. Not only did I still have my lone ranger mentality, but also I viewed the acceptance of help as an exposure of my weakness. I feared that accepting help put my disabilities on display. Thankfully, time has shown me the error of my ways: I now have no issue in asking for help. This can be as simple as allowing someone to hold a door for me (where every instinct in my body tells me to open doors for others) or as complex as accepting help in returning to work. 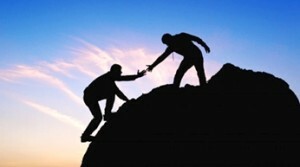 It is called ‘help’ for a reason; this act is in service of another. The scale of this might differ: a person helping someone cross the street might ‘help’ on a smaller scale than Martin Luther King, Jr. uniting a whole race. To me, help is help, whether the act is a big or small one. In this example, I see both as reaching in the same areas of their heart to help regardless of the scale, I’ve realized that no one gets where they are without some help. All people who achieve success on any level have great people behind them. The help I ask for might seem minor, but my acceptance of help in these instances signifies my willingness for assistance in other grander issues.